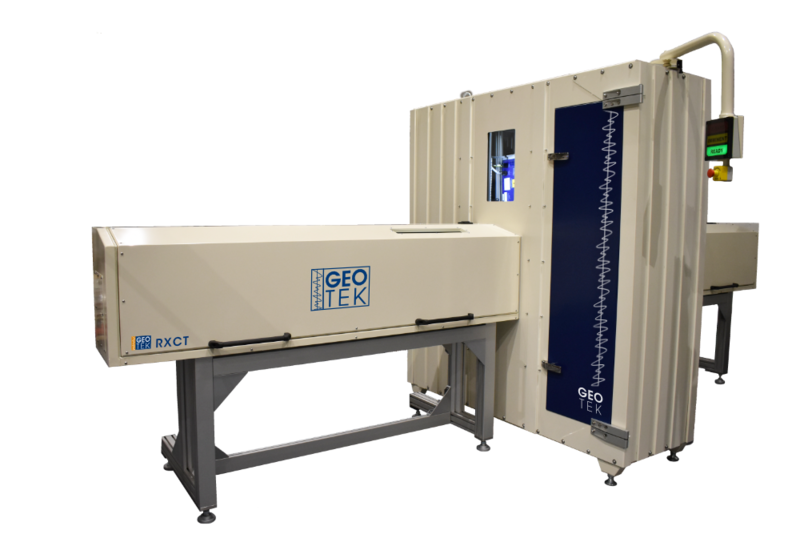 Rotating X-ray CT (RXCT) – Geotek Ltd. The Geotek RXCT system is Geotek’s most flexible and capable X-ray CT system that acquires both 2D X-ray transmission images and 3D X-ray CT volumes from lined whole core, split core, slabbed core, cores in singular boxes, and delicate cores that cannot be rotated. Automated rotation of the X-ray detector and source allows users to visualise and record three-dimensional structures within the cores. These rotational images are used for computed tomographic (CT) reconstructions. X-ray CT imaging provides valuable quantitative data as well as information about core quality for sub-sampling or further analyses. The X-ray source and detector positions are adjustable and can be optimised for image quality, resolution and core size. Whole cores are centralised by wirelessly controlled motorised arms that securely hold core samples horizontally. This innovative method allows for quick and efficient core loading for rapid scanning; perfect for field based studies, or large core logging projects. Split cores and slabbed rock can also be imaged using the mechanical arms and for weak liner or delicate samples the system can quickly be adapted with a plastic tube or tray to support the core. Core sections up to 155 cm in length and 15 cm in diameter can be inserted into the Geotek XCT system. Data are acquired in a continuous motion from the 16-bit detector and are output to the user as 16-bit grayscale TIFF images with a typical resolution of between 30 and 150 microns; these images can easily be converted, using Geotek software, to JPEG or other formats. There are many image analysis and core volume studies that will require a full 3D volume. The XCT is capable of acquiring 3D X-ray CT volumes at the resolution ranges mentioned in the table above. 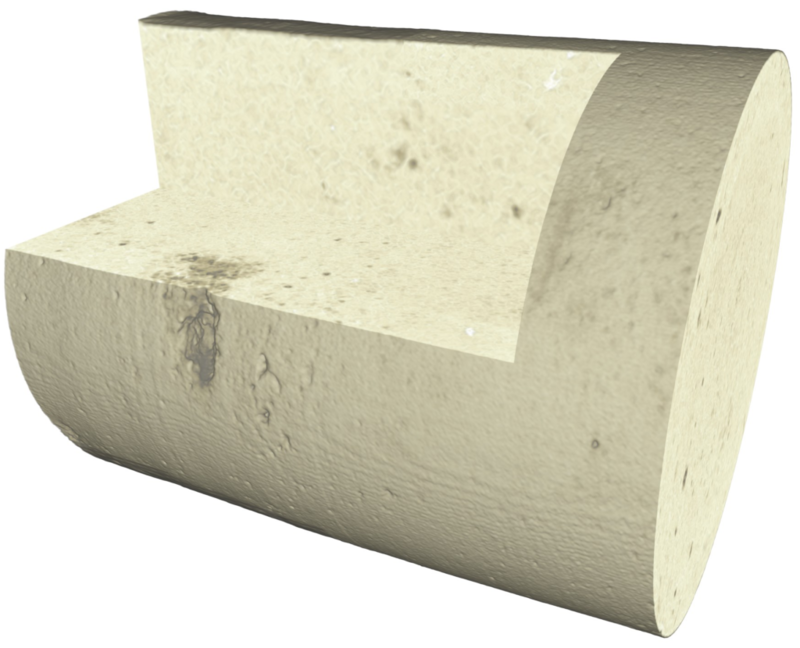 As part of the CT package Geotek provides software to reconstruct and view the core slices, generate orthogonal and circumferential images, and generate movies that fly through the core. The CT data from the Geotek system are exported as stacked 16-bit tiff files that can be loaded into the majority of CT viewing and image analysis packages. The rotating source and detector gantry of the RXCT provides excellent precision for X-ray CT acquisition, making the RXCT the perfect instrument for those users who are more interested in 3D X-ray CT datasets rather than 2D work. 37 micron resolution slice through an oolite plug sample. 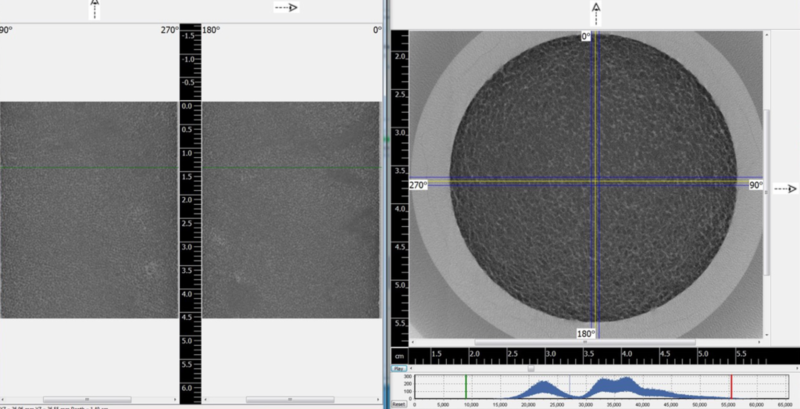 Geotek has developed a new image analysis feature called laminography. Laminography reconstructs 2D scans to extract a sequence of ‘slabs’ at increasing depths cross-core (with the depth direction being along the source-to-detector axis) . This is akin to optical imaging where features within each slab are brought into focus, with other features being blurred out as you move through the ‘slabs’. Each slab will be associated with a depth and therefore it will be possible to ascertain the depth and size of gravels, IRDs or shells within the core. See our Geoscience Research Application Page for more information.